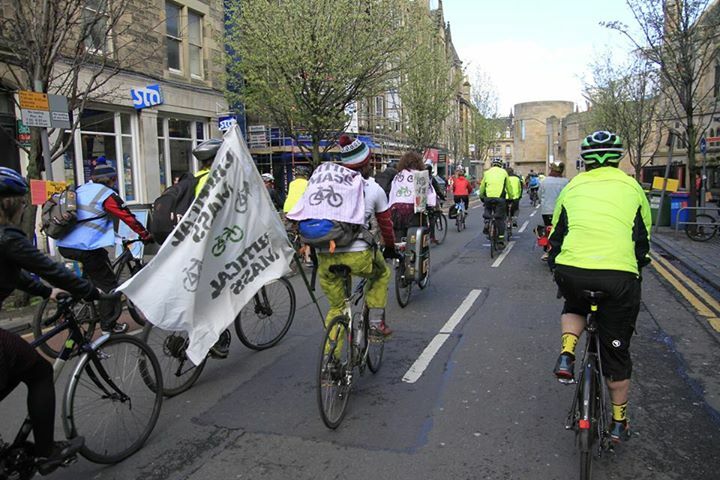 What a superb weekend it was for cycle activism! Not only did we have our own regular monthly Critical Mass ride on Friday but the following day there was Scotland’s legendary Pedal on Parliament (PoP) event – and you can bet Critical Mass made their presence felt at PoP with plenty of flags and and a couple of sound-systems too. 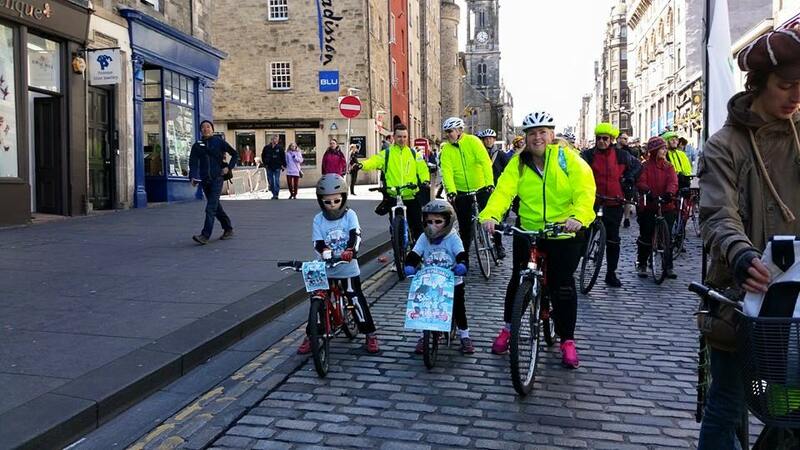 Pedal on Parliament has quickly grown to become a major event in the Scottish cycling calendar. 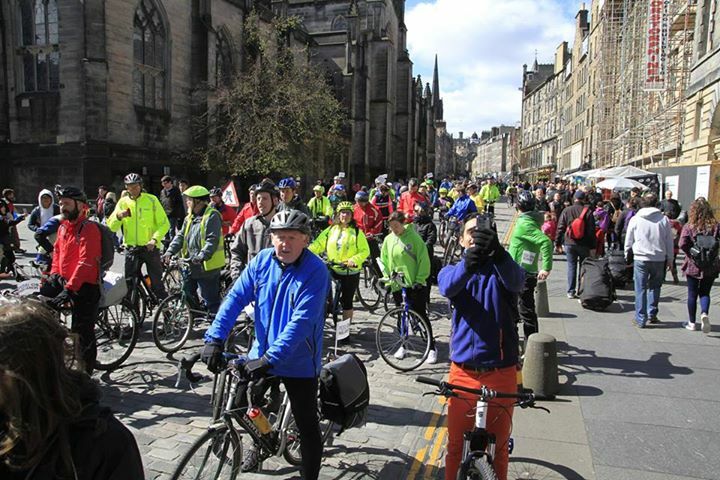 Now in its fourth year it attracts thousands of participants; the basic principle behind the ride is that by pedalling to parliament en masse, we send a clear message that cycling matters to a lot of people and not enough is being done by politicians to promote it. Proper funding for cycling (5% of the transport budget & 10% for active travel overall). Our streets are designed for cars and that’s why cars dominate – it could, and should, be different. 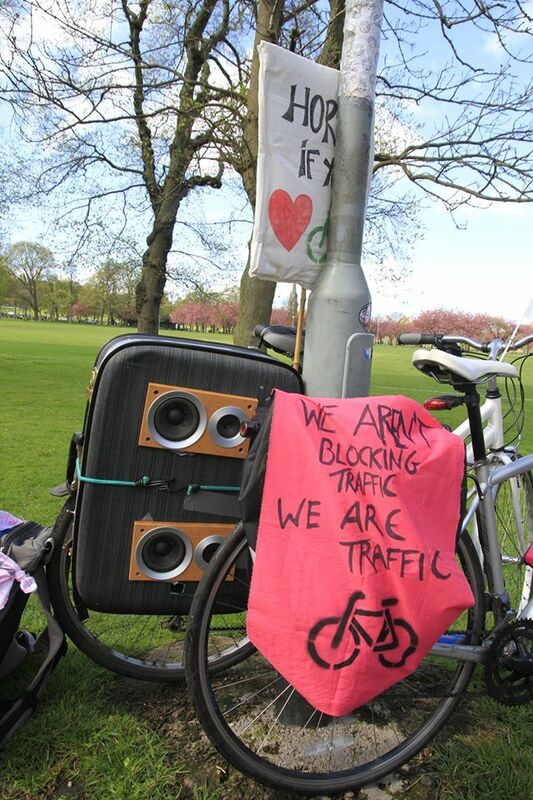 If we keep up sustained bike protests like those at the weekend it will be. PoP was an opportunity to let other cyclists know about the global Critical Mass movement, and to promote the idea that riding together for a shared cause can happen more than just once a year. about celebrating cycling and so we bring sound-systems, flags, whistles, bells, and ride in a way that shows cycling can be a lot of fun. Last Friday was one of my favourite rides with Critical Mass Edinburgh. We had put in a lot of energy making sure we would be able to promote our ride at Pedal on Parliament. We spent a lot of time making flags, making sure our sound-systems were up to scratch, and generally promoting the ride. 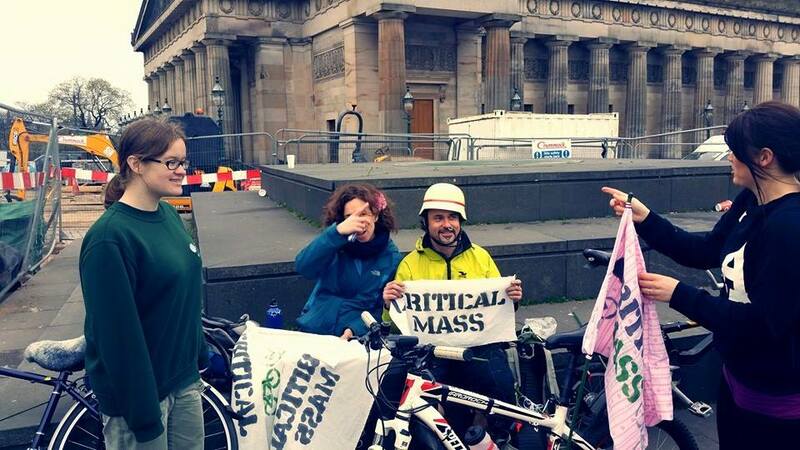 Many people who come to Critical Mass each month have become good friends to me and it is nice to unite over a shared purpose and when we met on Friday there was a lot of excitement in the air. We put up our flags, our sound-systems arrived (2 this time but we sometimes have more), painted our faces, and after a small talk before to promote a safe and friendly ride we took to the streets. The ride, as usual, twisted and turned through the centre of Edinburgh. – Edinburgh is one of the most beautiful cities and it is always nice to discover new bits and even re-discover old bits you know well but can’t help but see from a different light when there is a sound-system to your right and to your left and a big group of cyclists surrounding you. It is always a pleasure to cycle in a big friendly supportive group. And I think we need to do this more often. In the Netherlands they have a Critical Mass every single day (it’s not organised they just have the infrastructure that supports cycling – is it that hard) and there is no reason why it can’t be that way here. Until it is that way here lets get out and ride more together – at leat once a month and so I hope many of you got our flyers, spoke to some of our regular massers, or at the very least saw our flags and heard our sound-systems. 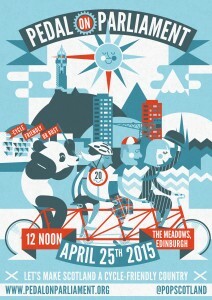 Come and join Edinburgh Critical Mass next time – 29th May is our next ride. 5.30pm at the Mound outside the Scottish National Gallery to leave at 6pm. If you can’t make that then catch us at 7pm at Mid-Meadow Walk. If you miss that then there is always next month, and the next month (the last Friday of EVERY month), but do catch us soon as the weather is turning really nice.